Biggest Challenge In 2016: …but for the second straight season, Bryant had a horrible November, dropping two straight vs. Sacred Heart and Robert Morris to limp to a 5-6 record and out of the NEC title hunt. Bryant needs to learn how to close games in November in order to contend for NEC championships. Biggest Departures: Four of the five top all-purpose yardage leaders graduate, but no departure is as huge as that of RB Ricardo McCray (1,270 rushing yards, 175 receiving yards, 177 kick return yards, 9 TDs). McCray was a workhorse that touched the ball on offense more than 10 times per game, and whomever steps into his shoes won’t have nearly the experience that McCray brought to the Bulldogs. On defense, CB Brandon Dagnesses, who led the Bulldog defense in interceptions, also graduates, leaving a big hole in the secondary to fill as well. 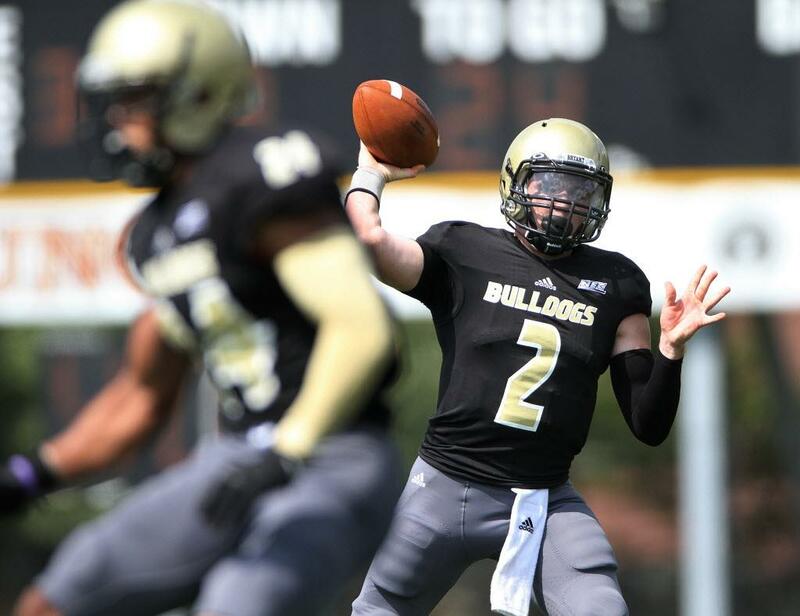 Players To Watch: When QB Dalton Easton did well, the Bulldogs generally did very well – against Duquesne, he threw for 330 yards and 4 TDs. But when he struggled – like his 4 INT effort vs. Sacred Heart – the Bulldogs generally suffered. In his senior season, can Easton bring the consistency to Bryant’s offense to allow them to become contenders? Defensively. LB Marquise Watson led the Bulldogs with 3 1/2 sacks and will be one of the captains on defense for Bryant in 2016. With LB Patrick Kenney, last season’s leading tackler, also returning, Bryant has a chance to have s solid defense. Biggest Game: vs. CCSU, 9/24/2016. The Bulldogs have an interesting out-of-conference schedule, starting with an expected win vs. D-II Merrimack, a tough trip to Bozeman, Montana to take on perennial Big Sky contenders Montana State, and a “Rhode Island Championship” battle vs. Brown. But it’s homecoming weekend on September 24th, with an ESPN3 broadcast, that should have Bulldog stadium buzzing. In what should be one of the best-attended games of the year for Bryant, it will be critical for the Bulldogs to get out on the right foot in NEC play, and the game vs. CCSU is a golden opportunity. Bryant In Two Sentences: It feels like Bryant’s season hangs on the arm of Dalton Easton. If he has a NEC offensive player of the year-type season, the Bulldogs could be NEC champions, but if not….